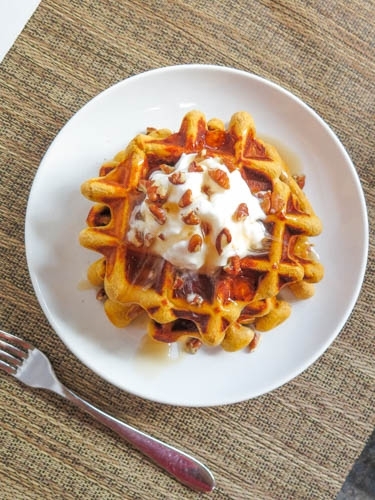 These pumpkin waffles donâ€™t just taste amazing, they get you into the Fall spirit! In a bowl mix all ingredients until well incorporated, set aside. Heat waffle iron on medium heat and PAM spray. Scoop Â¼ cup of the batter into the waffle iron and cook until lightly brown. Top with whip cream, chopped pecans, and syrup. Enjoy!